A few weeks ago, I wrote a blog post explaining how to find cheap solar cells for DIY solar panel on ebay. This time around I was thinking, what if someone does not want to spend the time to check and solder all the PV cells together. That will take a lot of time. Are we able to find a whole complete solar module? It doesn’t hurt to try to look for them on ebay. So, I headed to ebay main web site and type in “solar panel module” on the search bar locate on the top left and then hit the “Search” button. Immediately, I was presented with 87 search results matching my query. Most of the home solar modules were pretty expensive. Some of the modules were costing almost $1000! If we are implementing a DIY home solar power system, that will definitely break out project budget. I noticed there are a few offers that were selling at the range of $200 to $400. So I decided to look at them closely. Here’s what I found. Most of the residential solar modules are offered by small companies selling solar related stuff. I also found an offer from a seller that bought new solar modules for a project but it got cancelled. He was stuck with 40 PV panels and wanted to get rid of them. The price he’s offering is pretty high though. In this case, I would wait for a couple of weeks and check back to see if anyone took up his offer. If not, most probably he would have reduced the price. It’s time to make a bid. After going through some of the offers, I notice one thing a lot of the listings have in common. They only ship to the USA only. This is understandable because shipping overseas will incur additional charges. Not to mention import taxes. If you are looking for inexpensive home solar module, I guess people staying in the US have an added advantage. As I was scrolling through more of the listing, I noticed a solar module that was the cheapest among the others. That got me very curious and I decided to explore further. I didn’t see anything unusual, until I looked at the item location. The solar module is from Mainland China. That’s the reason why it is so cheap. The seller does mentioned they are willing to ship the PV module to anywhere around the world. You may have to add a couple of hundred dollars on top of the selling price for shipping and handling charges. Should you take up this offer? In a case like this, I am not sure. Goods from China are usually cheaper compared to product from the US, Germany or Japan. In term of quality wise, they may be substandard. If you were to buy the cheap solar module from China, be prepared to spend more time maintaining your residential solar energy system. So what is my conclusion? As it turns out, you can find cheap solar modules on ebay for a residential solar power project. People living in America have an added advantage because the modules are mainly delivered within the USA only. The really cheap solar modules are from China. In cases like this, you have to make your own decision whether to invest in the PV modules or not. A typical residential solar system will put you back ~$20,000+ after credits and incentives and requires extensive design work and several trained technicians toiling on your roof – drilling, wiring, bolting, and performing other complex tasks to build the proper infrastructure. 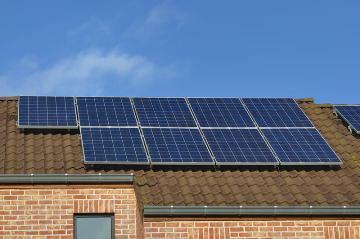 What if your roof were built for solar panels, and installing them were as simple as snapping panels into place.